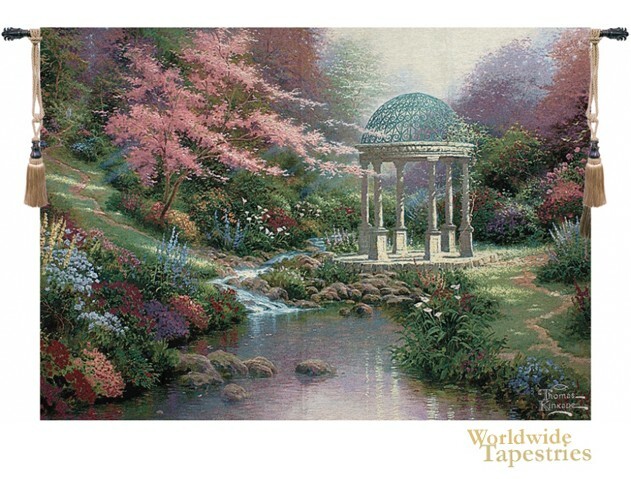 The Pool of Serenity tapestry shows the work of Thomas Kinkade. From Placerville, California, Kinkades works are one of the most collected in the US. Here we see a stream flowing into a river among a lush garden, with a beautiful columned dome structure which provides a haven in the garden surrounds. The pink blossomed apple blossom tree provides lovely color to accompany the mauves, blues and greens. This Pool of Serenity tapestry is backed with lining and tunnel for easy hanging. Note: tapestry rod and tassels, where pictured, are purchased separately.